This week provides a good example of how the Calendar of the Vetus Ordo is starting to to groan a bit because it has been unchanged since 1962 (I bet that's never happened in liturgical history before; and this sort of unresponsiveness to natural, gradual, evolution is itself, in fact, Untraditional). (2) S Catherine being a Patron of Europe, it is weird to have her on different dates in the two Calendars. A choice should be made. But my bet would be that these and all the similar problems will still be unresolved in 2062. Bad news, by the way, that pipnjim didn't make it home from exile in the Ordinariate Calendar. Not very Patrimony. I wonder what went wrong there? Is there anybody who still loves the Opifex? But in the Novus Ordo, there is nothing to stop a clerk from saying a votive Mass and votive Office of pipnjim on May 1. Satire and irony are among the few weapons that the Little (and impecunious) Man has. This is what infuriated the Anglican bishops when Dom Gregory Dix used the weapons perfected by Swift and Newman and Knox as weapons against persecution. Did a bishop try to prevent Anglo-Catholics from having the Mass of the Presanctified on Good Friday? Dix would assure them that we would certainly not go to the extreme of using a disgusting Peruvian Jesuit innovation [the Three Hours Devotion, which 'moderate' bishops and clergy rather liked]. He characterised Archbishop Fisher's creed as "God is nice and in him is no nastiness at all". He made clear how risible the Anglican episcopate seemed to him in 1947 when they sent a Loyal Address to George VI in which they referred to the then Princess Elizabeth with the words "We have watched her growth to ... well-developed womanhood". He commented that "Even when the stately summer of the Carolines was over, the Whig Grandee bishops of the eighteenth century and the 'Greek Play' bishops of eighty years ago still had something for which the genial energy of a business-man in gaiters does not always quite compensate". When the paranoid preoccupation of many bishops was to prevent their clergy at all costs from practising Benediction and Exposition of the Blessed Sacrament, Dix wrote "that even the best and most energetic of bishops will one day have rest from his labours, and the lance of his successor often delivers the diocese from the menace of some different windmill". They couldn't take that sort of approach, and his 'tone' was much lamented. Unsurprisingly, an Evangelical opponent wrote, after his death, of his "mischievous, maverick, learned perversity" as "charming, beguiling and bewitching". Dix formed two generations of militant Anglo-Catholics. It was not surprising that we used similar weapons to his when we were resisting the heteropractic innovation of Ordination of Women to Major Orders; we had a rather jolly journal called New Directions in which, under the editorship of the clever and witty Sarah Lowe, the effective weaponry of Satire and ridicule again successfully evoked criticism, from the Great and the Good, of our 'tone'. It is our experience that a good rule-of-thumb is: when people criticise your 'tone', you are almost certainly getting things right. But journals require resources. We may not have the wherewithal to print and to publish our laughter; our ironic mockery of the trends of thought, the intellectual fashions, which dominate both the secular and ecclesial worlds. This is where the blogosphere has been a mighty liberation for the Little Man. For example: faced by The Tablet, a powerful, respected, elegant and well-resourced platform on which trendy voices are enabled to show well (advocating Women's Ordination and unsound liturgical texts and the abolition of Catholic teaching about ethical matters and all the rest of the 'liberal' package), the Little Man, in the conditions of thirty years ago, would have had no resource except to write humbly to the Tablet's Editor and hope that, to demonstrate 'balance', his letter might graciously be granted an airing. If he poked wicked fun at the editorial policy of that periodical, calling down a great gale of public laughter upon its solemn and lofty pronouncements, his letter would probably be spiked! But now, with manageable financial outlay, he can write a blog! Those who have 'non-mainstream' views on Liturgy or Vatican II or anything else are no longer silenced or restricted to the smudgy pages of small fanatical newsletters with slender circulations. The grip of powerful hands - whether of newspaper barons or of the Tablet trustees - on the means of communication has been dramatically loosened. People feel free. People are free. Which is not to everybody's liking, because it brings challenge and exposure to some complacent dinosaurs which had been accustomed to roam through the landscape unchecked. One priest, who has for long enjoyed a regular column in the mainstream Catholic Press, handing down from on high to the hungry masses the pure nourishment of Vatican II, so disliked what a brother priest ... a blogger ... wrote about him, that he threatened to sue him (evidently I Corinthians 6:1-6 is not part of the Spirit of Vatican II). I suggest that, from Newman's to the present day, Satire and Irony have been the most notable charism which we from the coetibus Anglicanorum have brought into the life of the Catholic Church. And now you are lucky enough to have the Ordinariate to renew and replenish that gift, precisely (isn't Providence wonderful?) at a time when technology has created a free market for opinions. We are the right people at the right time and bearing the right gifts! I invite expressions of your gratitude to us!! All over the world, there must be members of that great network, koinonia, of Latin Rite Christian Communities whose Patron, whoever (s)he may be, has been transferred this year out of Holy Week or Easter Week - a magnificent but inhospitable fortnight - to this happy, easy-going, inclusive, catholic, receptive day, the Monday after Low* Sunday. As I said the Mass of S George Regni huius Patroni today, Double of the First Class, I recollected also my dear friends on Papa Stronsay, celebrating the Mass of S Magnus, Great Patron of Orkney (yes, that splendiferous Calendar hangs prominently above my desk.) So greetings to you! Nice to think that you were in red vestments too! And greetings to all of you out there who are also keeping your Patron's festivity today. 'Translations Monday' deserves a more romantic name. Any ideas? *BTW; it suddenly occurred to me .... could Low Sunday conceivably be a corruption of Close Sunday, videlicet the Sunday in clausa festorum Paschalium? My edition of the OED seems unable to take the name further back than the fifteenth century. The Sunday morning after we were married, we went to Mass at S Mary's Bourne Street, where a large clergyman talked (it's the only thing I recall from his sermon) about the certainty, before the War, of finding the entire Bench of Bishops, on Low Sunday, upon the shores of Lake Como. I wonder if Mgr Newton has persuaded his episcopal colleagues to adopt this piece of Patrimony. The week could be renamed Canon Vesey Stanhope Week. As far as I have been able to discover, the above two words are still the only ones available in Latin. Given the Holy Father's demotic style, and his ability to say or write quite a lot, I rather wondered how those responsible for the Latin, official, version, would get on. I don't envy them. But I can't imagine this Pontiff allowing a shortage of those adept in Latin Prose Composition to hold him up. Will he take to issuing his texts in another language? Mit brennende Sorge springs to mind as a precedent ... but that was not addressed to the Universal Church. When the Latin version emerges, official and definitive, its expression of nuances and ambiguities in the text will be very probably the doing of fairly low-level assistants put right up against the considerable problem of translating modern Spanish slang into formal Latin. One doubts if the Pontiff will have the time or the inclination to go through the Latin with a fine tooth-comb ... I don't get the impression that such linguistic games are among his favourite hobbies. So the 'official' words will not really be his. Is this not rather unsatisfactory too? A glorious occasion, yesterday, in the Assumption. A real expression of what we are as a people. As ever, Archbishop Mennini came to consecrate the Oils; he knows us well by now, shows every sign of liking us, and has settled down so well with us that you'd think he'd been an Anglican bishop all his life. Vivat. And fun to meet old and new friends; from the old Chichester diocese, they included my former colleague and long time friend, Fr Simon Heans, now assisting at the Minor Basilica (I nearly said "Where's Fr Tim?" before correcting myself; one instinctively assumes that all right-thinking people will be in the Ordinariate). From the old Exeter diocese, Archdeacon Ellis and the old Mafia; from the TAC, Bishop Mercer, Fr Brian Gill and Fr John Maunder (of the Major Basilica of S Agatha's). The cleverest man in the Church of England, Fr Geoffrey Kirk ... I must not go on. All the faithful remnant gathered in: Staggers and Pusey House and the SSC and Walsingham, now with one single corporate expression and identity in our Ordinariate. A notable absentee; but he was present in each of us: Pope Benedict XVI, most learned, most saintly, humblest of all the modern popes. Eis polla ete Despota. Just thinking of Chichester and Exeter and all the rest, calls up memories of that last, long glorious Indian Summer of the Church of England, before finally the sun set behind the clouds and the wind felt cold. To adapt Newman: "Exeter has gone, and Chichester, and ... ; it was sore to part with them. We clung to the vision of past greatness, and would not believe it could come to naught ...". Before I went to be incommunicado on Alderney, The Tablet had "suspended" their Rome correspondent. I've not been able to find out what's happened since then. Does anybody know? Have they sacked him, or are they waiting for it to blow over? After my fortnight doing Parish Duty on Alderney, and thinking about the controversies which have recently surrounded blogging, I have two conclusions to share with you. 1. Attacking living people. I think this should always be done temperately, if at all. Normally, and, preferably, it should be done without making things personal by using names. But this cannot unambiguously apply when a person deliberately puts himself in the public eye. The Diocesan Director of Liturgy who wrote a letter, on his office notepaper, to all his clergy, with copy to the Tablet, can hardly be deemed a shrinking and vulnerable violet at the edge of a field ... I like to throw in occasional allusions for readers of Sappho ... OK; he got a rocket from his bishop; so is that an end of the matter? Not necessarily. Because what he did represents a mind profoundly out of sympathy with the current liturgical law of the Church. It raises the question of whether he is suitable to do his job. I would not, for example, expect a bishop to make me a diocesan director of Novus Ordo Liturgy, in view of my known dislike of those post-conciliar liturgical innovations which explicitly or implicitly contradict the mandates of Vatican II. I would not have an appropriate mind for the job. And ... I don't know what's happened in the case of the Tablet Rome correspondent; but the question is not whether he has been rebuked, or has even apologised, but of the mind which he manifested. 2. Anonymity/Pseudonymity. I don't like it. I think people should put their (real) names to what they do. Especially if they wish to express themselves strongly; even more so if they wish to attack vigorously, even for plausible reasons, another named person. I accept that there can be exceptions justifying anonymity; a scholar may wish to float an idea without being held to it in foro academico ... I have been told that some Catholic priests and seminarians are afraid of their bishops or seminary rectors reading their views ... I don't think this says much for the health of the culture concerned, but, well, there you go ... Anyway; I have decided that attacks on other living people will not be accepted on this blog, even when thoroughly justified, if the comment is anonymous. ... it would provide the world with an attractive picture of a modern, open, inclusive, grown-up Catholic community at ease with itself and with modern ways if any bishops so concerned devised less Byzantine methods for expressing their views. They could try actually talking to bloggers. But I hope that the rumours, in each case, are as maliciously untrue as rumours so often are. Not long ago, I was in a European capital city, to say some Masses for the Latin Mass community there and to give a couple of lectures. The Bishop of the city invited me to breakfast; before breakfast, I said Mass in his private chapel: all laid out for the Vetus Ordo. His lordship most graciously served my EF Mass. After a truly sumptuous breakfast, he drove me round some of the more spectacular churches of the city. True xenia, true episcopal hospitality in the spirit of the Fathers! It is a sort of thing that leaves an extremely pleasant taste in the mouth, in more senses than one. ... to those who commented on this blog and haven't seen their comments. I returned this evening from a fortnight on Alderney, and have now enabled a selection of the accumulated Comments. And have tried to rush through the more personal of the mails. So you may find that a number of threads have suddenly materialised, attached to the pieces which I drafted before my departure and left to pop up as scheduled. After the Protect the Pope affair, and Cardinal Mueller's words about Ordinariate bloggers, I decided that it was appropriate to consider at leisure a number of matters relating to blogging. So I went off to a fascinating island fragment of the Duchy of Normandy and did a lot of thinking, while watching the gannets and tramping the cliffs of an island where every headland is crowned with a superb mid-Victorian castle (my Lord Palmerston, who wanted to keep Napoleon III out) and, juxtaposed, elegant if menacing Art Deco fortifications (Herr Hitler, who wanted to keep the Allies out). Not to mention an exquisite Roman Naval Signal Station ... I can't quite remember whom they wanted to keep out. In a day or two I'll tell you what I thought. One of the jolliest parts of the 'Formation'* process for Ordinariate clergy was the Faculties Exam.. We had to assimilate what our Pagella said we could or couldn't lawfully do ... a very brief document ... and then 'pass' a viva voce exam on it. Of course, everybody passed with flying colours, even though some of the Reverend Fathers had been as nervous as Third Formers beforehand, sitting under S Thomas More's mulberry tree in the garden of Allen Hall and 'revising' with each other in twittering pairs. Moi, I was done by a charmingly dry woman canonist. Q So you're about to say Mass and a nun turns up saying that she will be delivering the homily. What do you say to her? A "Gosh, Sister, how absolutely splendid! I'm so glad. Tell you what. So as to make sure that the folks remember it, let's make it the very last thing they hear just before they go out. I think immediately after the Dismissal is the best time". Q Hrrrmph. Very tactful, I'm sure. But of course, it would be quite different if she were a Reverend Mother. ... and more of the same. It was so enjoyable that I felt a bit miffed when she cut it short just as I thought I was really getting into my stride. I often seem to have this sort of effect on people. My wife has a completely absurd theory about why that is. I had arranged to meet Fr Colin Spikenard, and Jill his wife, at the Italian restaurant just over the river and looking back across to Hiram's Hospital. Not Michelin Five-Star, but good real Italian. We all knew we would be happy in the Sole di Capri. It is not without a hint of a bit of a dash of a suggestion of the Bay of Naples (very Pauline, all those genitives, yes?). "What", I began, "about Barchester's new bishop?" Jill scowled, and intimated that sustenance came first. I don't tangle with Girton women, least of all those from 1960s Cambridge when a girl trying to get in had first to surmount the hurdle that there was only one women's place to every nine men's places. So I settled down to the menu. Nothing flash; good old Sixties standbys. Parmigiana di Melanzane, I thought, and then the Saltimbocca. Fried courgettes. We got all that settled with the somewhat non-Italian waitress, and then wrapped ourselves round the alcohol. Jill took her nose out of her glass and snarled "Armitage", paused, and then sibilated "Shanks". She had a point. Armitage Shanks was twenty years junior to Colin and myself at Staggers (one knows one's getting old when bishops start to look as if they've only just got rid of their acne), but his reputation was well known. Very High Church, but mainly preoccupied with the career of Armitage Shanks. One can pinpoint the exact day on which he "changed Integrities" and so merited his first mitre. Jill then said the sort of word which nice girls used not to utter, but after all, she had been at Girton and so she probably knew all about its etymology. Since his wife, uncharacteristically, appeared only semi-articulate, I turned to Fr Colin. Perhaps I should have mentioned that he is pastor of the Barchester Ordinariate Group. He had run a very good show as Vicar of S Gregory's, Barchester. "Bulldozers", he said, and stabbed one of those cocktail-sticky things at a green olive in a bowl. I was glad about that, because I prefer the black ones myself; but I felt that I was not getting very far very fast with either of them. "Did you go to see him? ", I asked. "Yes I did", said Father. "At first, all he would say was that he would rather have S Gregory's bulldozed to the ground than have it go to the Ordinariate". There was a pause while another olive (again, green, mercifully) went unde negant redire quidquam. "I said that the entire congregation was coming with me ... the church would be empty ... but that just made his eyes go sort of bulgy. So I said that all we asked was to be able to hire the church for an economic rent when his Anglicans weren't using it ... if he found any Anglicans to put in it ... no, I didn't say that last bit ... and then he played his smart card ... the Bishop of Hogglestock agrees with the policy ... thinks it would be Divisive for Ordinariate congregations to have their own places for worship ... even more Divisive than the Ordinariate having its own Chrism Mass ... we can have 3.00 on Sunday afternoons in the Sacred Heart ... as long as we remember that we can't use incense because it would set off the fire alarms ... ... and not to try to get into the Confessionals because they're used as stores for the unwanted produce left behind by the Bring-and-Buy sales ... ". We paused while the waitress, in her deft Slovak way, put our starters in front of us. Jill stuffed one of her whitebait into an evidently hungry mouth and then, in clear, angry tones, said "And now he's handed S Gregory's over to the Evoes". "For a church-plant", her husband added, "and if they can't fill it he's going to sell it to the Moslems". Focusing, as one does, on details of Churchmanship, "Shia or Sunni? ", I enquired. The quip was not well received, especially by Jill, who has not, I suspect, read Nostra aetate with much religiosum obsequium. I assimilated a mouthful of my egg-plant, thankful that I hadn't ordered church-plant, and pondered the profounder implications of this intelligence. Would the planning authorities insist that the minarets were pastiche Butterfield so as to match the original fabric? Would that make it the first Anglo-Catholic mosque in the world, as well as the first mosque in Victorian polychromatic brick? 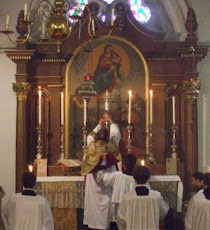 In the English Coronation Service, which happens, of course, in the context of a Solemn Pontifical Mass, only the Celebrant, Sacred Ministers, the Sovereign, and the Sovereign's Spouse receive Holy Communion. I wonder if this piece of Anglican Patrimony could be a useful contribution to the solution of a problem in the Latin Church. Not that many Catholic parishes have a weekly coronation. What I have in mind is the difficulty often raised by Nuptial Masses at which there is a general, or open, Communion. We all know that this is problem. It's not just a question that crops up with regard to mixed marriages or in post-Christian England. Even where Catholicism is still the cultural 'fall-back' religion of a society, as in Ireland, there must be an increasing problem of people who are lapsed making an act of Communion when not in a state of grace. Of course, it is not for us to judge the state of another man's soul; but clergy do have a pastoral duty not wantonly to create situations in which it may prudently be foreseen that people might eat and drink "not discerning the Lord's Body". Frankly, I see very little problem about confining Holy Communion at a Nuptial Mass to the Happy Couple. There is already a social convention that they are, on this day, a very special couple, Monarchs, as it were, for a day (even if we Latins do not, as the Byzantines so happily do, crown them). It could very easily become accepted as part of their special and privileged status that only they received Holy Communion. It would obviate all the unease we naturally feel about the apparent discourtesy of 'excluding' from a general Communion those who are not of the household of Faith; indeed, may not be even nominal believers. I shall delete all cracks about confining Communion at Funeral Masses to the Deceased. But I do wonder about the modern conventional wisdom that Masses without a general Communion are ipso facto and always improper. In a curious sort of way, our age which prides itself sometimes on flexibility is often fairly rigidly uniform and doctrinaire. When I was an undergraduate in the early 1960s, the Pusey House Sunday High Mass was non-communicating; College Chaplains were sensitive about PH filching communicants from the 'primary worshipping community' of the College Chapel. PH claimed simply to 'supplement' and not to replace College chapels. And at nearby S Mary Mags, the High Mass was non-communicating and Communion was given from the Tabernacle ten minutes before Mass began. I think that 'limited Communion' should be regarded as a valid option when a particular pastoral good suggests it. I am not advocating it as a norm! [Cranmer was] always, from first to last, dependent on an imperfect text of Scripture, on a narrow range of patristic material, as yet but partially understood in relation to its true historical character, and above all on 'the latest thing from Germany'. It is hardly surprising that his laboriously fashioned structure proved to be, doctrinally and liturgically speaking, a house of cards. But it is ever to his credit that in his command of English and above all of the rhythm and melody of words, he bequeathed to us a treasury out of which may yet be fashioned in the end 'a manner of the holy communion' far more 'agreeable with the institution of Christ, St Paul and the old primitive and apostolic church' than ever was his own. Jalland might so easily have been talking about the Ordinariate liturgy. Have you taken the opportunity - either in Warwick Street or Oxford - to experience it? A similar much earlier post on this subject elicited the comments on the appended thread.